We have had a very productive year. I want to say first of all, Merry Christmas and a Happy New Year to everyone!! Our academy has produced a great assortment of leaders, scientists, students and mentors for the future. First of all, I want to give a special thanks to two very special people that have made our web site a very popular read internet source of information. Dr. Jeff Snow and Lee Ann Urban both have given great information, knowledge and intuition in so many areas that have helped myself, as well as a majority of students to read, educate themselves and to better themselves. I also note that The BJJ Doctor has treated myself and many of our students to heal and get back on the mat training. This man is a Saint, and a man destined to heal. Ms. Urban is right there as well, as I personally have witnessed her development of weak muscles on our own students that seek council when they have their own injuries overcome with muscular training. Next, I want to give a very special thanks to all of my students that have trained, developed their own technical angles, and the support for other students in class. I have had a good year to think, review and write my articles. I enjoyed the articles from 2009 and my September 2010 article specifically on achieving black belt in BJJ. The time, blood, sweat and tears are a philosophy I know myself, and I mentor others. I note when we have talented black belts like Rob Furlano, Carter Fisk, Gary Claxton and others who have had very difficult injuries in their careers, they all have overcome or dealt with their injuries. The most important point is these athletes never vented, got angry, pestered or ever expressed any negativity. They all trained, developed and these three are an example of many others that train around injuries, simply went to class to train. This is a pioneer effort of developing that angle of thought toward a leader role. I note that we have had new Black belts in BJJ, and I note these are respected black belts who also have credibility, experience, and of course their own talents that developed them. In September last year, I was very proud of Mr. King Webb, Carter Fisk, Manny Galvan and Gary Claxton when I awarded them their black belts. These men have overcome injuries, ideas, and strategies and carved their own chapter in our lineage book. When Rob Furlano, Ted Osburn, Jeremy Carbone, Ed Aiken, Matt Serfoss and Jay Hume received their Black belts, I looked at men who are leaders, and great generals in our own community. I will state that I have never been so proud of what we have developed and grown. We are a community. We are a function of scientists, brothers and sisters, and teachers and students. I enjoyed my first Black belt clinic on December 3. There are many clinics in the world where black belts attend, but I am proud to state that I had my own black belt clinic with my own black belts. My point is that I am very proud to see my loyal, hardworking scientists that I can work with to develop their sciences. This also allows me to assess, train and develop new ideas for each of their particular games. Our academy has really changed over the year. We gave her a new look and style. This year I have had classes where there were five or six other black belts training or assisting. This mentoring and assistants mentoring have helped our junior students develop a better game, style and improvement with all the help from their big brothers. My instructor Master Carlos Machado was very happy to teach in September, and we are always glad to host him to share his knowledge. Master Machado has been my mentor for fifteen years, and I have learned from his depth of knowledge and science that has helped me develop myself as an instructor. I also state it was one of my proudest days as an instructor to award six awesome black belts. I enjoyed and tested myself to develop an arm-locking seminar earlier this year. My goal was to teach new ways to arm bar that I have developed to help students that have shorter legs, less flexibility or guard games are not their strongest suit. Wow, did I enjoy it. I also note that my senior Black belt Gary Claxton taught his first seminar in Buda at our VBJJA representative’s academy. I thought of the Machado brothers when I wrote my article of the month a few months ago. I thought about their past, their greatness, and history and lineage that some may not know or forgotten. I had pictures of the brothers when I was a white and blue belt. In October, we had such a great support for our academy that I showed up to some painting and touching up on the school and 30 plus students were already there taking pride to help and become a part of the school. This was such a great display of loyalty, I then in return taught a no gi clinic with some new designs for no gi. My thanks to all of you great, great students. The William Vandry BJJ Association now has ten associations in Texas. 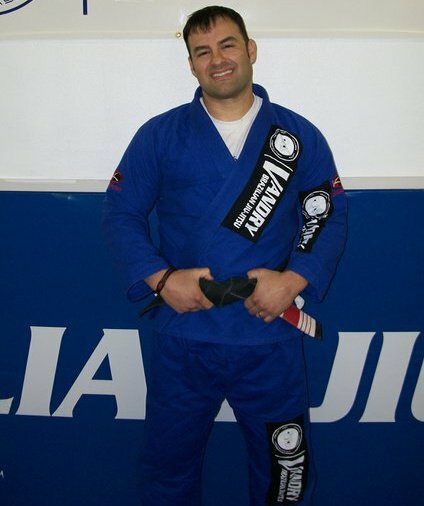 My goal was to develop spreading the philosophy of Jiu-jitsu, its history and lineage way back almost 8 years ago. I dreamed of the day I would have ten associations under me, but the reasons differ from general business. It helps to preserve a legacy, and spread to others that may not have heard of us, and to give them a martial art that helps them develop mentally, physically and psychologically. My December 2010 seminar was a great day for our academy, representatives, students and a piece or a chapter of our lineage and history. I want to congratulate our academy Judo class instructor Geoff Dennis for receiving his third Dan Black belt from Dr. Stan Seider (5th Dan Judo). The importance of this rank, which I note both of these Judo instructors are also Jiu-jitsu students, is a point I made. Judo is our cousin. So is wrestling and Sambo. These four grappling arts are great martial arts. All of them have good merit and knowledge. And all four of these should never be forgotten. I myself saw the popularity of BJJ shoot up to the top in the 90’s and to this age. It seems every other block there is a BJJ school or class. This happened with traditional martial arts. And unfortunately you have the less than credible instructors in the world that at times bring down our art or mislead it. I personally don’t want to see Judo extinct. It is on level with the great Tasmanian wolf from many decades ago that were hunted to extinction. I support Dr. Stan Seider and Geoff Dennis with their Judo. I was honored to have their own award rank ceremony at our seminar, and I am most humbled by their gift to me, which is an actual original book of Judo with Jigoro Kano’s signature. How humbling. I am a person that believes in developing new ideas and techniques. I believe you should always strive to better yourself as a martial artist, a person and a member of society. You have a responsibility that you should charge yourself with at all times. There are good people, bad people and very ugly people in the world, and despite our flaws, we have to better them to make tomorrow better. Also a quick shout out to our new purple belts, Craig Smith and Adam Brand, and our new blue belts Kevin Clark and Scott Cavender. On a special note, I want to thank these young men who attended, and special salute to the three new orange belts from our academy, Garner Pugh, Luke Teeler and John Carey. My thanks to all of my students, association representatives and our community in general. I look forward to 2011!